In a small saucepan, combine rice vinegar, agave nectar, water, soya sauce, 1/4 cup canola oil, ginger, garlic, flour, and sesame seeds. Whisk the sauce together and place over medium heat. Simmer until the sauce is slightly thickened, 8 to 10 minutes. Keep warm. In a large bowl, combine ground turkey, grated onion, garlic, ginger, parsley, five-spice powder, egg, breadcrumbs, salt and pepper. Mix well to combine. 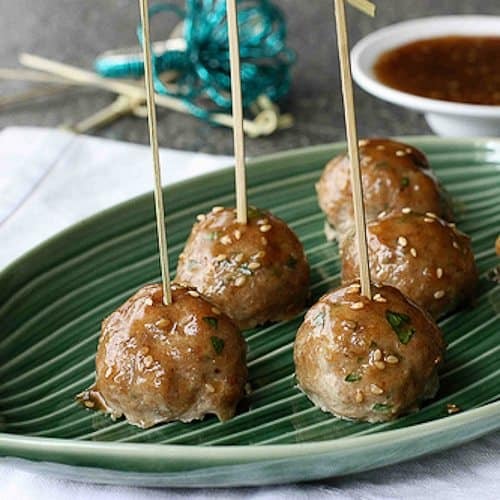 Using a 2 tablespoon portion of the turkey mixture, form meatballs by rolling between the palms of your hands. Place the meatballs on the prepared baking sheet, spacing evenly. Bake until the meatballs are firm to the touch and cooked through, about 15 minutes. Brush the meatballs liberally with the sauce. Return to the oven for 5 minutes. Serve immediately. These can be served over rice or as hors d'oeuvres. Either way, serve with the extra sauce. © 2011 Cookin Canuck. All rights reserved.